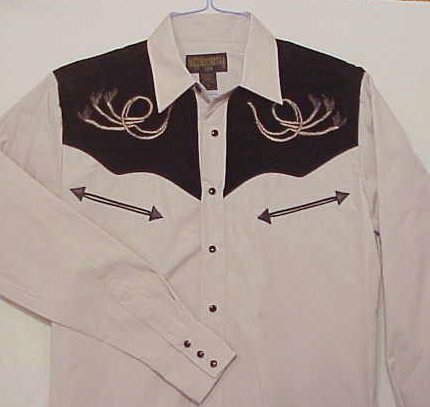 This shirt is one of the SHARPEST LOOKING western shirts one will ever see! It is a nice beige or light tan color. The black velvet-like panel with the beige rope braiding on the front makes for a wonderful contrast. This has to be one of the most UNIQUE while being TASTEFUL at the same time, western shirts that I have ever seen. It possesses a BIT OF FLASH without being too wild. 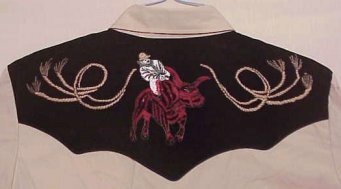 The back has a black velvet-like panel as well with this FANTASTIC BUCKING BRONCO and beige rope braiding once again. Like the rest of these shirts, this shirt feels like a somewhat heavy sturdy cotton, yet it is a poly cotton blend. It has a very nice weight and feel to it; it is definitely made of a quality fabric that won't disappoint. This FANTASTIC GEM is capable of being machine washed (inside out), hand washed or of course, dry cleaned. Size and satisfaction are guaranteed or returnable as long as not "worn" or washed with buyer paying all shipping costs. Sizes: S, M, L, XL $45.00 S&H $5.50 Email BBBWWW@aol.com about size availability before ordering.